Accessor interface for the KTextEditor framework. 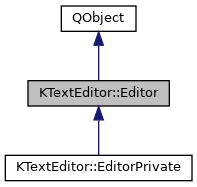 The Editor part can either be accessed through the static accessor Editor::instance() or through the KParts component model (see Using KTextEditor as KPart). The Editor singleton provides general information and configuration methods for the Editor, for example KAboutData by using aboutData(). The Editor has a list of all opened documents. Get this list with documents(). To create a new Document call createDocument(). The signal documentCreated() is emitted whenever the Editor created a new document. The config dialog can be shown with configDialog(). Instead of using the config dialog, the config pages can also be embedded into the application's config dialog. To do this, configPages() returns the number of config pages that exist and configPage() returns the requested page. The configuration are saved automatically by the Editor. It is recommended to embed the config pages into the main application's config dialog instead of using a separate config dialog, if the config dialog does not look cluttered then. This way, all settings are grouped together in one place. With Commands it is possible to add new commands to the command line. These Commands then are added to all document Views. Common use cases include commands like find or setting document variables. The list of all registered commands can be obtained either through commandList() or through commands(). Further, a specific command can be obtained through queryCommand(). For further information, read the Command API documentation. Definition at line 93 of file editor.h. Function that is called to expand a variable in text. Definition at line 255 of file editor.h. Create the Editor object and pass it the internal implementation to store a d-pointer. Definition at line 82 of file ktexteditor.cpp. Definition at line 88 of file ktexteditor.cpp. Get the about data of this Editor part. Current hosting application, if any set. Get a list of available command line strings. Get a list of all registered commands. Show the editor's config dialog, changes will be applied to the editor and the configuration changes are saved. Instead of using the config dialog, the config pages can be embedded into your own config dialog by using configPages() and configPage(). Get the config page with the number, config pages from 0 to configPages()-1 are available if configPages() > 0. Configuration changes done over this widget are automatically saved. Get the number of available config pages. If a number < 1 is returned, it does not support config pages. Create a new document object with parent. For each created document, the signal documentCreated() is emitted. Get the current default encoding for this Editor part. Definition at line 100 of file ktexteditor.cpp. The editor emits this signal whenever a document was successfully created. Get a list of all documents of this editor. Expands arbitrary text that may contain arbitrary many variables. On success, the expanded text is written to output. Definition at line 177 of file ktexteditor.cpp. Expands a single variable, writing the expanded value to output. Definition at line 155 of file ktexteditor.cpp. Accessor to get the Editor instance. This object will stay alive until QCoreApplication terminates. You shall not delete it yourself. There is only ONE Editor instance of this per process. Editor controller, after initial construction, will live until QCoreApplication is terminating. Definition at line 92 of file ktexteditor.cpp. Query for the command cmd. If the command cmd does not exist the return value is NULL. Registers a variable called name for exact matches. For instance, a variable called "CurrentDocument:Path" could be registered which then expands to the path the current document. true on success, false if the variable could not be registered, e.g. because it already was registered previously. Definition at line 108 of file ktexteditor.cpp. Registers a variable for arbitrary text that matches the specified prefix. For instance, a variable called "ENV:" could be registered which then expands arbitrary environment variables, e.g. ENV:HOME would expand to the user's home directory. A colon ':' is used as separator for the prefix and the text after the colon that should be evaluated. true on success, false if a prefix could not be registered, e.g. because it already was registered previously. Definition at line 120 of file ktexteditor.cpp. Set the global application object. This will allow the editor component to access the hosting application. Unregisters a variable that was previously registered with registerVariableMatch(). true if the variable was successfully unregistered, and false if the variable did not exist. Definition at line 135 of file ktexteditor.cpp. Unregisters a prefix of variable that was previously registered with registerVariableMatch(). Definition at line 145 of file ktexteditor.cpp.